This large cabinet—standing over 8 feet tall—bears witness to the international character of visual culture in Spanish America. 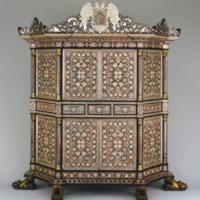 It is decorated with elaborate floral designs worked out of mother-of-pearl, tortoiseshell and exotic woods. Inspired by smaller works imported from Asia and the Philippines, artisans in Perú used the mother-of-pearl inlay technique to create luxury objects, like this one for an elite clientele. This in an imposing piece of furniture, in part because of its ostentatious and dazzling décor, in part because of its size—the cabinet measures 102 x 89.5 x 26 inches (ca. 259 x 227 x 66 cm). Artisans carefully cut and inlaid mother-of-pearl to create shimmering designs, among them floral motifs, which are also found in inlaid furniture from the Philippines. Set at the top is the double-headed eagle, a symbol of the Habsburg dynasty, who ruled Spain when the piece was made. Upon the eagle is the coat of arms of the Tagle family, which was added after the piece was made. They owned the piece in the late 18th century. The family’s town house in Lima is featured in Vistas. The identity of the patron of this work has survived, but that of its artists have not. 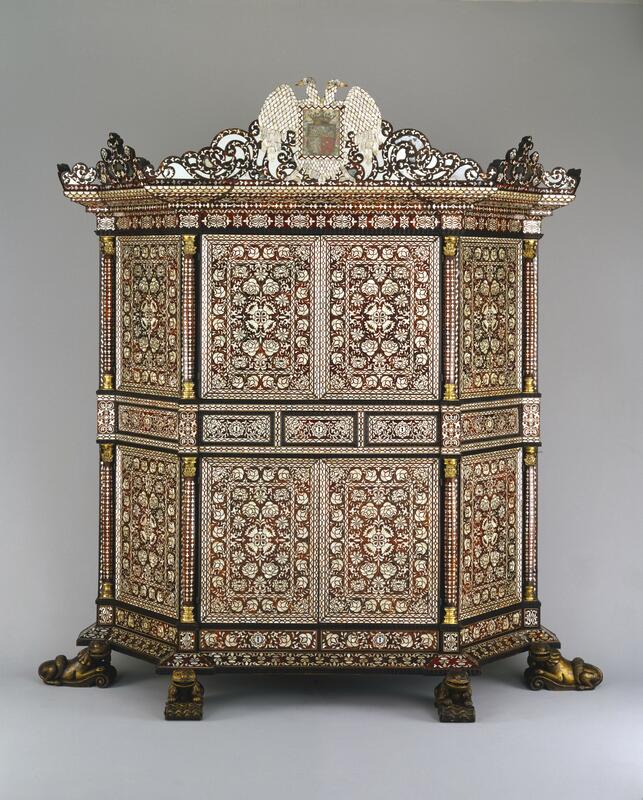 A Viceroy of Perú, don Melchor Portocarrero, third count of Monclova (r. 1689-1705), was the first owner of this cabinet and may have commissioned it. Another almost identical cabinet exists in a private collection suggesting that this kind of work may have been the specialty of a single workshop. In Spanish America, materials like mother-of-pearl and tortoiseshell were relatively abundant, and artisans used them lavishly. The cabinet was first made out of mahogany wood, and then a veneer of carefully cut mother-of-pearl, bone, ebony and tortoiseshell was applied. Many of the designs are outlined in pewter. Extravagant pieces of furniture were one way that families showed off their wealth to others of their social circle, and this would have been a prized piece. A descendant of the cabinet’s first owner (Viceroy don Melchor Portocarrero) was Josefa Portocarrero y Zamudio. She married into the prominent Torre-Tagle family in Lima, probably in the 1770s, and may have brought the piece into the family as part of her dowry or inheritance. It was at this point the Torre-Tagle coat of arms at top was likely added. Considerable disagreement exists about the original of this and other pieces like it. It is so similar to works made in Goa and the Philippines, that some scholars believed these works to be imported through trans-Pacific trade. More likely is that it was the techniques, or the artisans themselves, that migrated into Peru, which became a center for the manufacture of these elaborately inlaid pieces. Works such as this thus exemplify a vibrant interchange of not only luxury objects but also people, techniques, styles and ideas among Asians, Latin Americans and Europeans. Reproduced courtesy of the Dallas Museum of Art; gift of the Eugene McDermott Foundation, in honor of Carol and Richard Brettell. Aste, Richard, ed. 2013. Behind Closed Doors: Art in the Spanish American Home, 1492-1898. Brooklyn: Brooklyn Mueum of Art. Kotz, Suzanne, ed. Dallas Museum of Art: A Guide to the Collection. Dallas: Dallas Museum of Art. Rivas, Jorge P. “Desk resting on a bufete.” 2006. In The Arts in Latin America, 1492-1820. J. J. Rishel with S. Stratton-Pruitt, eds. Philadelphia: Philadelphia Museum of Art, and New Haven and London: Yale University Press, 490-91.